I just upgraded from a 1991 Honda CRX hf (I'm getting too creaky and sore from climbing in and out of it--otherwise a great little fuel sipper) to my 2004 Honda Accord LX last Monday. It is so much nicer having comfortable seats, working A/C, being high enough up in the air to actually see what's happening around me in traffic, etc. I paid all of $4900 cash for it. Nary a dent, qualifies for a buyback guarantee from Carfax and it had only one owner before me. She always took it in for all the usual maintenance and tune-ups so it runs like a top. 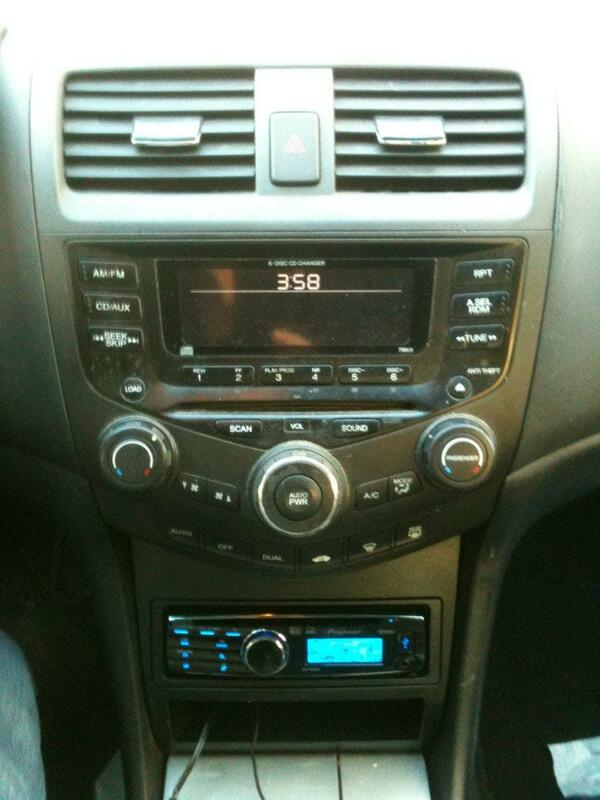 Anyway, I noticed the stock stereo wasn't working but there was an aftermarket radio/CD player below it. After doing some research here and elsewhere online, I think she had the aftermarket radio installed due to the usual circuit board failure. It seems odd that it wasn't repaired by Honda and when I spoke to my local dealership they said my Accord was too old and even then my VIN was outside the range of the original warranty extension. I heard the same thing from Honda America when I called in to ask for a goodwill repair or at least to chip in on the cost of the repair. Having hit a brick wall, I went back online and found some DIY videos on how to solder the errant board to fix the issue. Great! I have a buddy who's not only a genius but he's a mechanic who always helps me with car stuff I can't figure out. Yesterday we took the dash apart, removed the A/C-radio unit and hooked everything back up just to make sure the previous owner might have just not wanted to use it. It powered right up! But, then we noticed the lack of a backlight and absolutely no sound, not even a hiss from the radio. My buddy double-checked all the connections and finally decided that he would have to do the solder job after all. He'd been hoping it would be a quicker, easier fix. Today I was at the Honda Owners website and on a lark thought I'd retrieve the radio code. I still have the original Owner's Manual with all the paperwork from when the Accord was sold in 2004 with only 15 miles on it, but the space for the radio code was blank. Luckily I'd snapped a couple of photos of the radio unit once it was detached from the bezel before my buddy put the dash back together. It was too late last night to go on so he'll do the soldering later this week. I kept getting an error message about the registered zip code not matching my VIN, etc so I called Honda America again. The nice lady went through registering my Accord again and when we came to the radio code, she was stymied as well. The bezel in my Accord indicates that it should be a six disc player/radio with an auxiliary input for XM radio or bluetooth, etc but the radio attached to it seems to have came from a 2003 Accord and was a single disc player! The Honda rep told me that the serial number on the Honda tag on the radio did not match my VIN at all. She could only advise me to wait until my buddy is finished soldering the circuit board, reinstalling everything and then calling Honda America back and getting whatever serial number flashed up on the screen to retrieve my radio code. She didn't seem to be all that eager to talk about what it meant that I appeared to have a radio belonging to an older Accord attached to the bezel. Is this unusual as radios go? I suppose there are a hundred different, logical explanations but it seems to me that it would have made more sense to just have the original stock radio left in place or repaired. As for why I'm going to all this trouble, well I really don't care to make my Accord look like some kid has it with flashy stuff all over. I want it to look as stock as possible. I think the stock radio is just fine as is and I'd prefer to attach a bluetooth unit to it after its fixed so I can do the handsfree music from my iPhone without needing to plug it in, etc. The stock radio/HVAC unit that came with my Accord is the typical set up. It isn't dual climate control or navigation. It doesn't have the XM logo on a button but my understanding was I could still install it as an option to the stock radio. For all the great care the previous owner lavished on this Accord, the stereo is the only jarring note that has me wondering what happened. here is what happened with my car, and possibly the explination for yours. my radio went out, the backlight which is covered by warranty. I took it in and honda replaced the unit with a refurbished unit. about 6 months later that unit went out. Honda only warrants the replacement once. I bought a radio and put it in the lower dash. now chances are when you turn the radio on you dont hear anything because your speaker wires are run to the lower deck. the factory honda radios in those models are garbage. they have a ton of documented problems and I personally had two of them go out on me. My honest suggestion would be to get the new metra kit that replaces the stock radio and controls the dual climate control and move your stereo up into the factory location if you really want to remain as factory as possible. it is not quite factory and I dont feel it looks as good as the factory stereo in that place. but your car will be back to fully functional and you wont have the stereo located in the lower cubby. Last edited by neophyte; 10-10-2013 at 08:45 AM. yep, likely the radio in your dash was a replacement to the one that originally failed, then after that the owner went aftermarket. aftermarket is your best bet with the kit that replaces the climate controls. sadly, that is the only real flaw with the 7th gen Accords (and it wasn't made by Honda, but by Panasonic or Pioneer). aftermarket will give you good bluetooth and ipod/iphone compatibility. I really like the newest Alpine CDE-HD149BT. Your video has me excited about what I might be able to do with my '04 Accord with navigation. Mine gave me the "check you disc" error this weekend and I've done all I can to get it working but I think it's just shot. Seeing that metra made a double din that works with the climate control is good news. Quick question: after seeing your video, I wasn't able to make out if your display above your vent still work. Does your clock, climate, and radio station still display? Also if you don't mind, what radio are you using now? I'd like to make sure I find one that has a similar size that fits right. Anything missing from the old layout experience besides seeing gas mileage on your display? Thanks for any input or suggestions. I am running a deck in my lower cubby. I found that video on youtube. I dont have anything above the vents in my car. it is a 2003. the dash kit I know does display the climate control temp and the clock. The radio would display the radio station. Last edited by neophyte; 10-29-2013 at 11:45 PM. Does anyone who has installed the Metra kit for the 2004 range Accord with navigation know if after installing a new radio in the space provided by the Metra kit that the display above the center two vents still work? They currently (stock) display driver and passenger side climate temps, clock, and radio station. I'm sure these will work, but am wondering if it's tied into the original stock navigation unit that I will be replacing at some point? Hello, it's me again. I'm seeking the opinion/wisdom of anyone with more experience about the whole stereo/HVAC control issue. After my last update, we found that it was just easier to put everything back as it was. It was and still is a pain at night as I always have to turn on the map light to see what button I am pushing to operate the climate controls, but the Accord remained looking more or less stock aside from the single-DIN Alpine stereo where the cubby used to be. Fast forward to today: For about a week I've been watching with baited breath the whole Apple CarPlay introduction play out online. It looks just like something I always wished I had. I started researching CarPlay and how it works. I found from various news and tech articles that CarPlay simply runs on top of whatever factory settings a stereo might have as long as the stereo has Blackberry's QNX OS on it. I'd never heard of QNX before but took it for granted that since it has been used by Jeep, Dodge, etc since at least 2009 that it must be a fairly common item in a lot of stock and aftermarket car stereos. Imagine my surprise to find out that QNX isn't currently licensed to aftermarket stereo makers. Then I read very recently that CarPlay is being rolled out only to very high end vehicles with neither Apple nor many of the carmakers apparently preparing to offer it to older models like mine anytime soon. Frustration! Well, after that dust up, I decided that since warmer weather is coming anyway, why not fix my stereo/HVAC panel issue once and for all? I've been looking around and I see that eBay and Amazon do have some replacement units that are either aftermarket or in a few cases have been salvaged from higher end Accords that had the touchscreen navigation. I've been mulling over buying one of those units. At least then I'd have a fully functional stereo/HVAC bezel with lights at night, etc. I mentioned it in passing to a local Honda parts person and he was adamant that doing ANYTHING to the stereo/HVAC was a terrible idea and that I just needed to get used to my current situation. I think he was just toeing the company line since they didn't stand to make any money if I pursued my idea, but does anyone here think that using a salvaged module from another Accord that just happens to have the nicer touchscreen, etc would work? Or should I just go another route completely? I looked at that Metra panel and I hope nobody from that company is reading this, but it is fugly as sin. I'd rather stay with my current setup than install that. I really don't feel too comfortable about buying an aftermarket replacement that comes all the way from China. I couldn't find too many reviews about them and the few that I did seemed to be mostly split between negative and indifferent with the odd rave here and there. I really like my Accord and I'd love to roll a little bit of current tech into it but without it turning into some kind of cheap-looking Christmas-colored affair that a kid would fall in love with. Stock Stereo to iPod - Newbie!